Unless you plan on feasting upon nature's bounty, there are really only eight plants which you need to beware of while hiking or camping in the Appalachian Mountains. These eight plants are known to cause poisoning, or rather dermatitis, upon contact. A few of these plants are only found in low areas, along roads or streams, or in specific regions, so it is unlikely that you will encounter all of them unless you are traveling over a long stretch of the Trail. Although a few of these plants are edible or medicinal when harvested and prepared correctly, they are best avoided by the uninitiated. 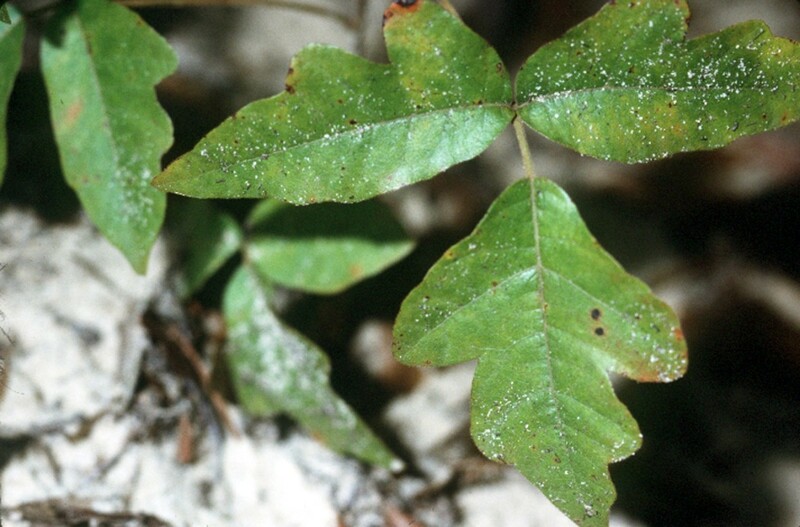 Description: Atlantic Poison Oak is an erect shrub between 1 ft. to 3 ft. in height. The leaves are approximately 6 in. long, alternate, with three leaflets often resembling the leaf of the white oak. The leaflets are normally hairy and variable in size and shape, turning yellow or orangish-red in autumn. The fruit is tannish-white or greenish-white, small drupes, covered with a velvety pubescence (fuzz). Look-alikes: Staghorn Sumac (Rhus Typhina ), Eastern Poison Ivy (Toxicodendron radicans ) and Western Poison Ivy (Toxicodendron rydbergii ). 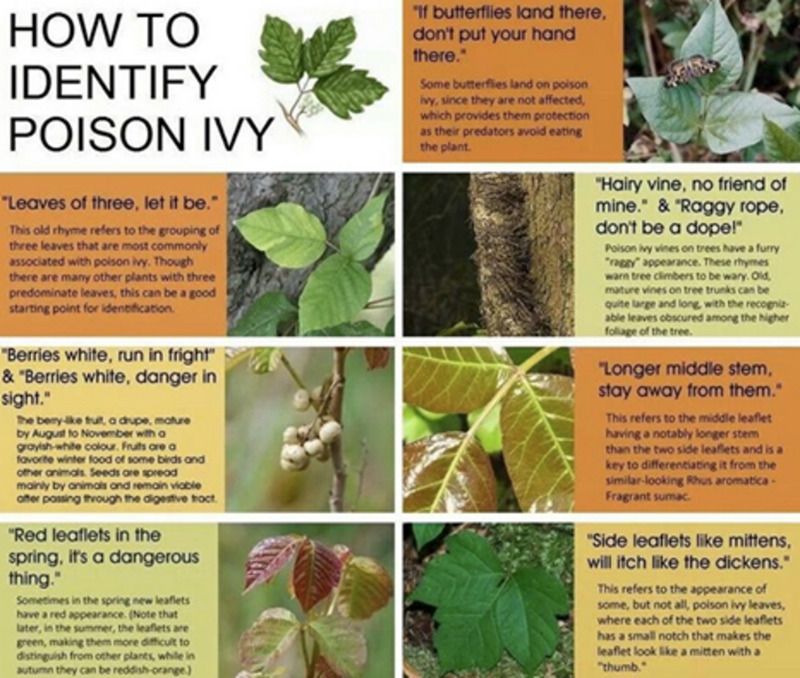 Special Notes: You are not that likely to encounter this plant unless you venture into low land areas in the southeast, but you may, on occasion, encounter Poison Oak. Eastern Poison Ivy (Toxicodendron radicans) is prevalent on the A.T. Description: Poison Ivy is not a true Ivy (Hedera). It can either be a woody vine, a groundcover, or a shrub. 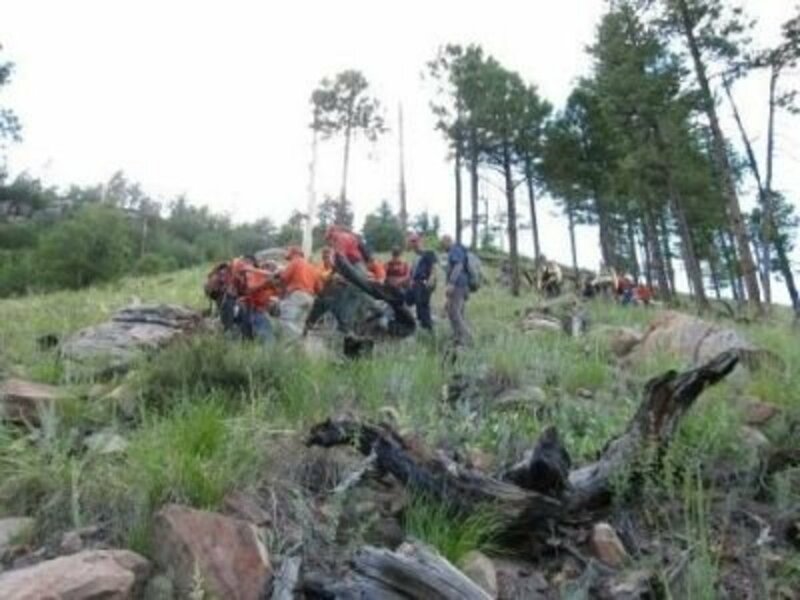 The height of Poison Ivy is variable. The leaves are trifoliate with three almond-shaped leaflets containing few or no teeth. The leaflets are alternate and approximately 1-4 inches long with either a light or dark green color. Leaflets are smooth on top, sometimes shiny, turning reddish in the autumn. The fruit, which is small drupes, is amber or grayish-white in color. Look-alikes: Virgin's Bower (Clematis virginiana ), Box-elder (Acer negundo), Virginia Creeper (Parthenocissus quinquefolia ), Poison Sumac (Toxicodendron vernix ), Atlantic Poison Oak (Toxicodendron pubescens ), Western Poison Ivy (Toxicodendron rydbergii ), blackberries and raspberries (Rubus spp. ) and Fragrant Sumac (Rhus aromatica ). Special notes: This plant is used by some homeopaths to create the remedy Rhus tox. 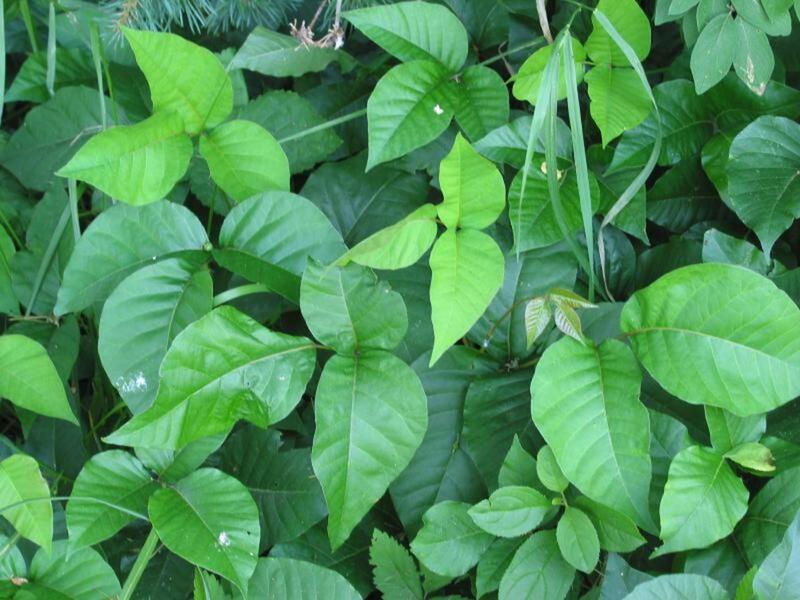 Eastern Poison Ivy is found throughout the Appalachian Mountains. Nettles (Urtica spp.) are used for food and medicine when properly harvested and prepared. 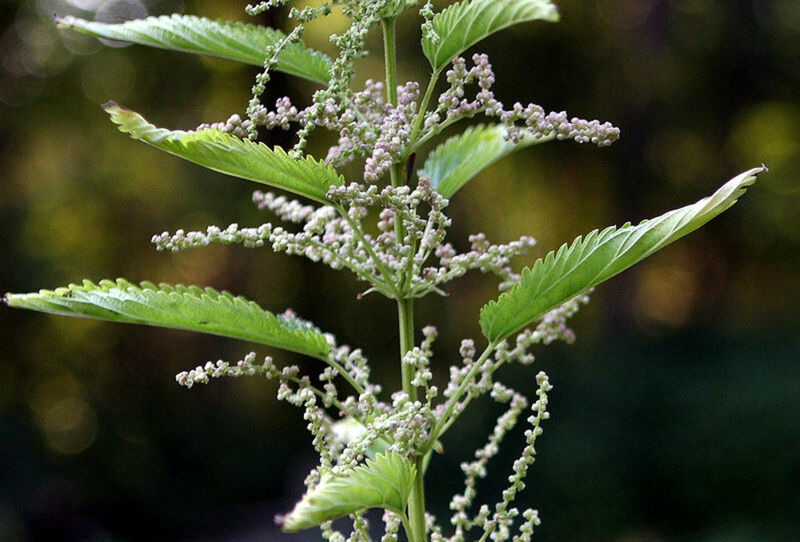 Description: There are 30-45 species of nettles in the genus Urtica . Most are perennial, but some are annual, and most contain stinging hairs on both the leaves and the stems. They are generally 2-4 ft. in height, but can grow larger. The leaves and stalks are opposite pairs, with leaf blades that are either elliptic, lanceolate, ovate or circular, and usually serrated or toothed. Special notes: Nettles are used in the preparation of medicines, as teas, and also steamed and eaten as a cooked green. 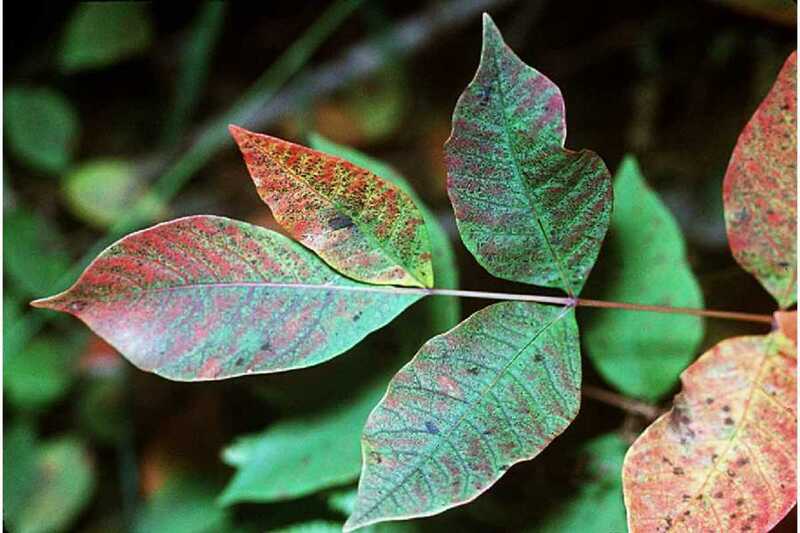 Poison Sumac (Toxicodendron vernix) is sometimes considered to be the most poisonous plant of eastern North America. Height: up to 15 ft. Description: Poison Sumac is a small tree or large woody shrub that grows up to 15 ft. in height. It has alternate pinnate leaves with 7-13 entire, or toothless leaflets. It can be distinguished by its red rachis (stem which connects the leaflets) and its smooth shiny leaves. The leaflets are 2-4 inches long and green to greenish yellow, changing to yellow, red, or deep purple in the autumn. The fruit begins as greenish drupes then changing to white when ripe. 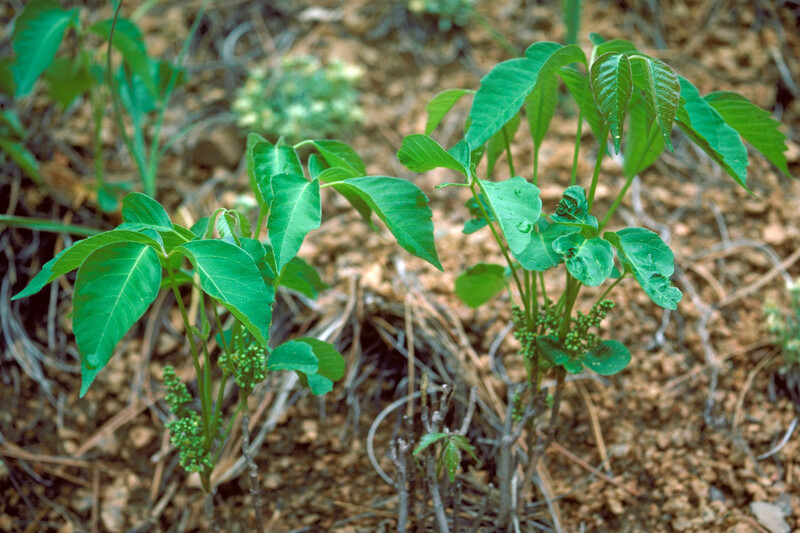 Special notes: You will only come across Poison Sumac in very wet soils or flood plains. Trumpet Creeper (Campsis radicans) is also known as Cow-itch Vine. Description: Trumpet Creeper is a large woody vine and perennial best known for its large trumpet-like flowers. The leaves are opposite, pinnate, ovate and dark green with 4-6 pairs of leaflets. The leaves are 2-4 inches long. 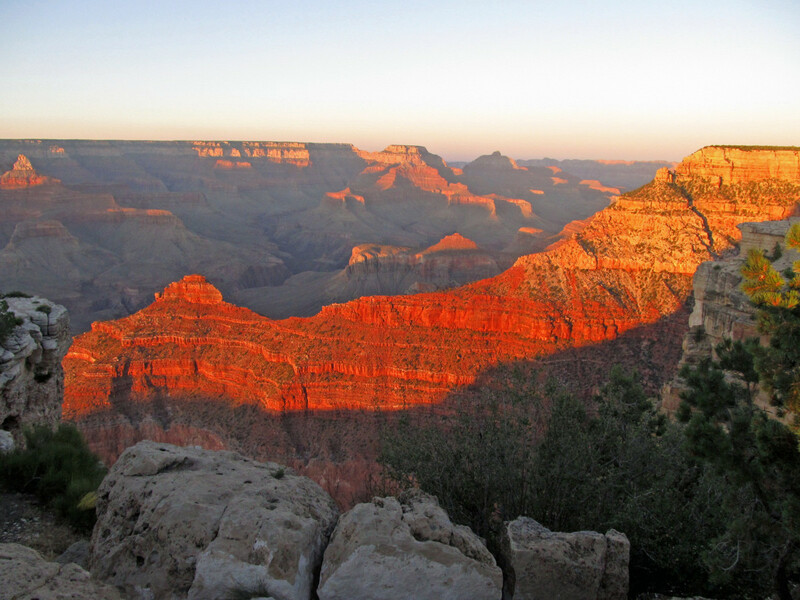 From June-September its large trumpet-like flowers bloom in beautiful orange to red colors. The fruit is a brown pod usually about 3-5 inches in length. Look-alikes: Sometimes inexperienced individuals mistake the Trumpet Creeper for Eastern Poison Ivy (Toxicodendron radicans ). Special Notes: Hummingbirds love the Trumpet Creeper. It will most likely be encountered along fence-rows, and occasionally growing on telephone poles. Description: Western Poison Ivy is an upright woody shrub growing between 2-7 feet in height. 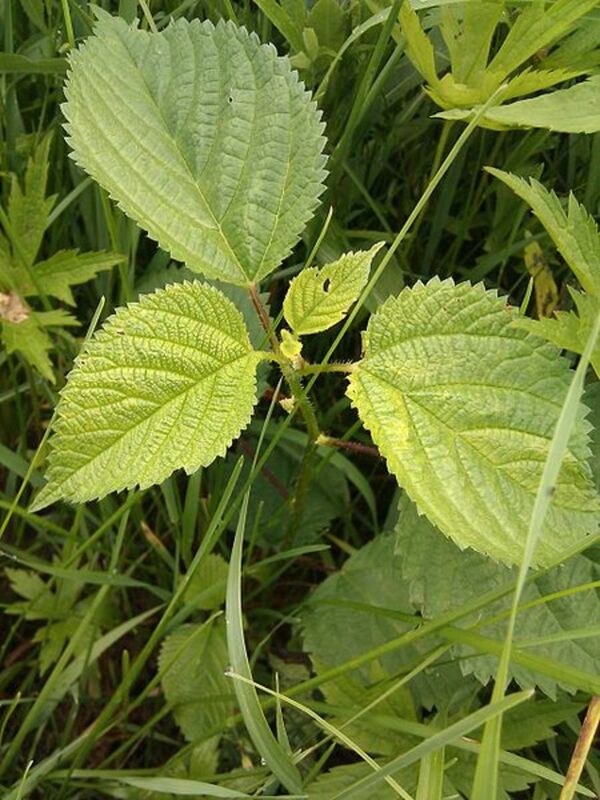 The alternate, bright-green leaves are trifoliate with three ovate to rhombic leaflets, 1-6 inches long. The leaflets are round, dentate or entire. Leaflets are smooth on top, sometimes shiny, turning reddish in the autumn. The fruit, which is small drupes, is round and yellowish in color. 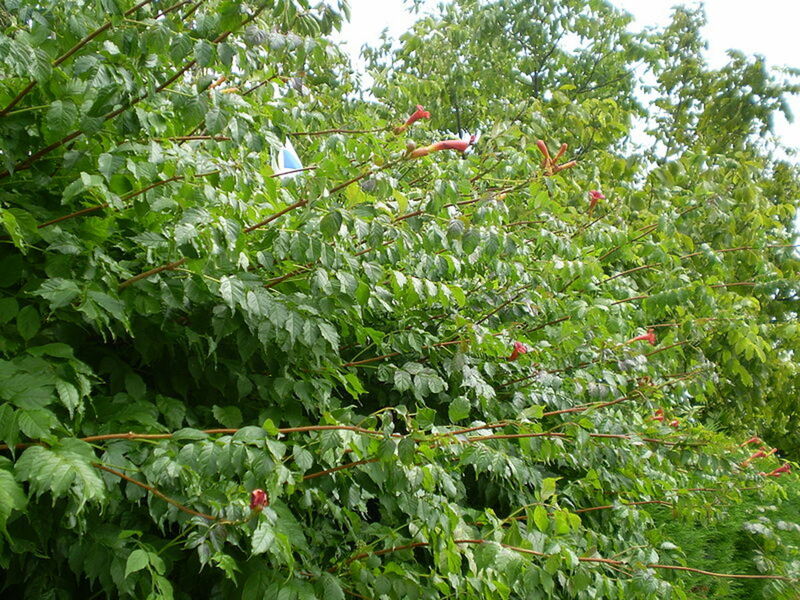 Look-alikes: Virgin's Bower (Clematis virginiana ), Box-elder (Acer negrundo ), Virginia Creeper (Parthenocissus quinquefolia ), Poison Sumac (Toxicodendron vernix ), Atlantic Poison Oak (Toxicodendron pubescens ), Eastern Poison Ivy (Toxicodendron radicans ), Blackberries and raspberries (Rubus spp. ) and Fragrant Sumac (Rhus aromatica ). Special Notes: This plant is used by some homeopaths to create the remedy Rhus tox. Like Eastern Poison Ivy, Western Poison Ivy is found throughout the Appalachian Mountains. Description: The Wild Parsnip is a biennial plant that is 2-5 feet tall and occasionally branching. The alternate leaves are oddly pinnate with 9 hairless leaflets. The individual leaflets are 3 inches long, ovate or elliptic, and 2 inches wide with course teeth (usually more than 8). 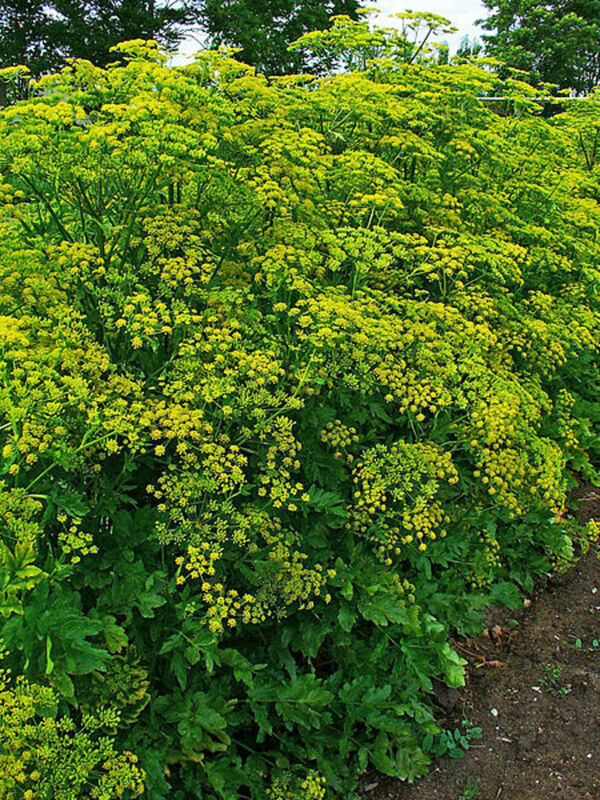 The yellow flowers (late spring thru mid-summer) form a compound umbel which is 3 to 8 inches across. Look-alikes: Poison Hemlock (Conium maculatum) and Water Hemlock (Cicuta spp.) - a mouthful or a nibble of these is enough to kill you, if ingested. Special Notes: The root of the parsnip is edible, but the shoots and leaves contain a photosensitive chemical which can cause a horrible reaction (phytophotodermatitis) if the substance gets on the skin and is exposed to sunlight (think chemical burns). Description: The Wood-nettle has plenty of stinging hairs. It is an annual or perennial which grows between 1 to 4 feet in height. The leaves are ovate, with sharply toothed margins and heart-shaped bases. The alternate leaves are up to 6 inches in length and medium to dark green in color. The leaves are hairy and the stems and petioles are covered in stinging hairs. Special notes: Most likely to be encountered along stream-banks or other moist wooded locations. if you don't watch out you will be annoyed. poison sumac, nettles and all will be good. Tamarajo - A whole ditch full? Ouch! I am particularly susceptible to that evil little plant. I am one of those people who will get poison ivy just by looking at it (apparently it is safe to look at pictures though - ha). 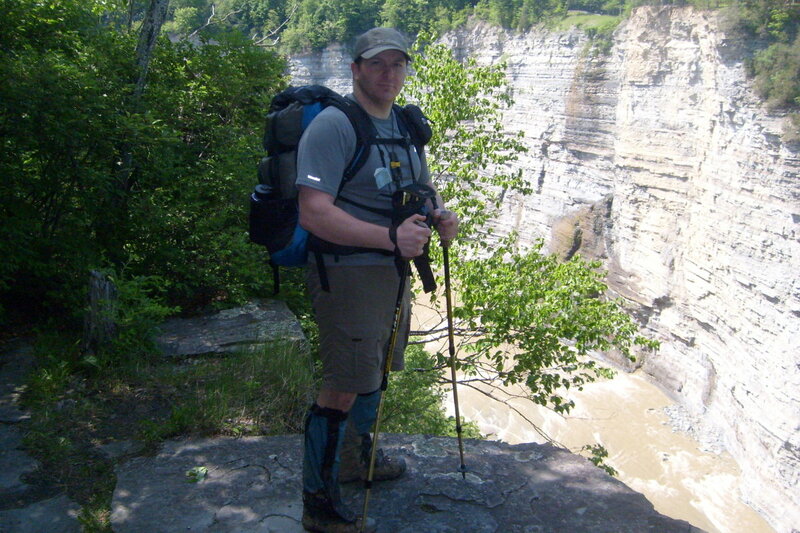 One time I got poison ivy in my boots, somehow, and it was one of the worst experiences of my life! The photos are a great help. I have an entire ditch full of poison ivy and woody area infested with sumac. I have lots of work to do. I am keeping the parsnips however as their root is edible. Thank you Greensleeves Hubs! I agree. I have lived in the Appalachian Mountains of Pennsylvania my whole life. My brother and I used to play in the deep woods all day long, picking berries, climbing trees, and such. I probably had at least as many run-ins with vicious plants as I did animals, though I can count those times on one hand. Those times, growing up in the Pocono Mountains where probably the most memorable days of my life, in which, I probably learned more about nature than all other times in my life combined. Interesting and useful page for anyone travelling in the region, or with an interest in wild plants. Of course I would agree with the point about stinging nettles - like the thorns on blackberry plants, the function of stinging hairs on nettles is to protect the plants, precisely because the leaves are good to eat. People think of plants as being docile and passive don't they? The truth is they can be as nasty and vicious as any animal! Good page. MelissaBarrett - Yes. If I was not clear enough, the stingers found on nettles are not poisonous, just irritants. Nettles are safe for consumption AFTER proper preparation. Deborah-Diane - thanks for commenting. I was actually wondering why there was really nothing available online concerning this specific topic for that very reason. 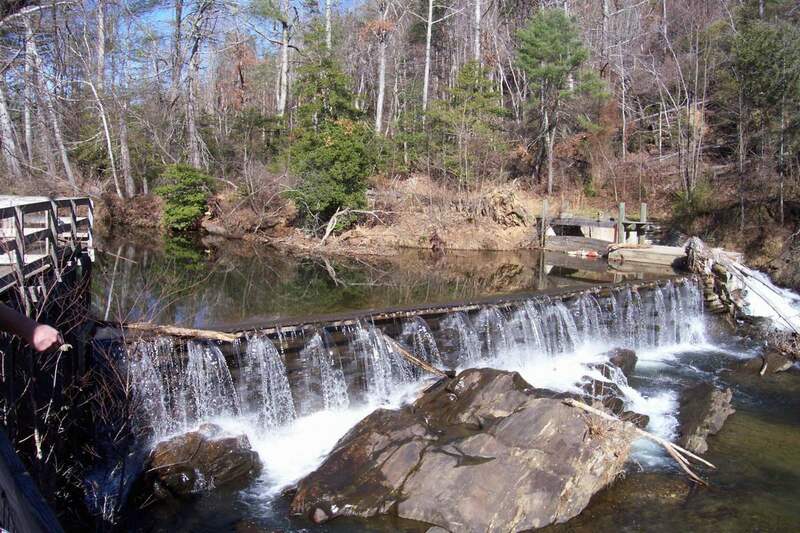 This article will be very helpful to tourists on the Appalacian Trail, too!